She and chemistry have chemistry. 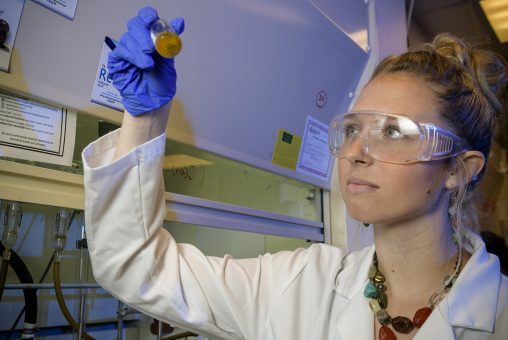 Catherine Evers Smith, a senior chemistry major at Wright State University, has had a love affair with chemistry since high school. Evers Smith grew up in Morrow near Cincinnati. Her mother is in research and development at Procter & Gamble; her father works in the TriHealth hospital system. After graduating from Mount Notre Dame High School in 2016, Evers Smith selected Wright State over several other schools. “One of the reasons I liked Wright State because you can get involved in research as a freshman,” she said. 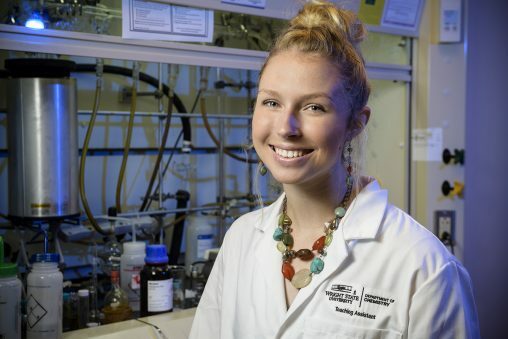 Evers Smith is part of a research team that won a $462,195 award from the National Institutes of Health to work on a novel approach to fight cancer. Kuppuswamy Arumugam, an assistant chemistry professor in the College of Science and Mathematics, and Jonathan F. Arambula from The University of Texas at Austin, are leading the effort, which includes postdoctoral, graduate and undergraduate researchers such as Evers Smith. But research and classwork are only part of what Evers Smith does. She is a learning assistant for General Chemistry II, treasurer of the chemistry club and a member of the Dean’s Circle, the Pre-Health Society and the Student Honors Association. After graduating in May, Catherine Evers Smith hopes to attend to medical school and eventually work as a medical scientist, with an M.D. and Ph.D.
Evers Smith also volunteers at Miami Valley Hospital as part of the Hospital Elder Life Program and at the Center for Neurological Development in the village of Burkettsville west of Sidney. Evers Smith took up judo and is the only female member of Airstrike, Wright State’s Ultimate Frisbee club team. Evers Smith is scheduled to graduate in the spring and has begun applying to medical schools, including the Wright State Boonshoft School of Medicine. Her career goal is to be a medical scientist, with an M.D. and Ph.D.